Yet, as Patrick Lencioni, author of The Five Dysfunctions of a Team explains it, far too many teams have too little conflict. This phenomena can be measured on what he calls the conflict continuum. What Is The Conflict Continuum? On one end of the conflict continuum is zero conflict or “artificial harmony.” On this end, people appear to be in harmony, to be getting along, but they’re not really connecting or understanding each other. It is a sort of false, surface level paradise. You don’t want your team working on this level because as my mentor was fond of saying, “Full potential is not achieved in a serene environment”. On the opposite end of the spectrum lays intense, harsh, ill-intentioned conflict. Clearly, you don’t want to be here either. This is the negative, non-productive aspect of conflict. 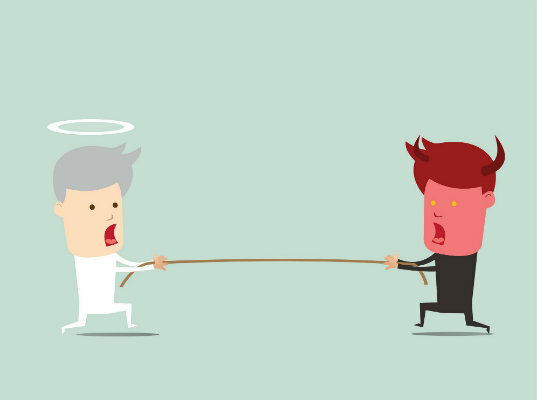 This type of conflict creates a toxic culture and leads to a lack of productivity. As Lencioni describes it, most organizations find themselves towards the zero conflict end. What those teams need to do is move closer to the center of the continuum. Invite a little bit of productive conflict into the mix, by actively encouraging debate and dialogue around ideas and issues, until you are practically toeing the line that crosses over into destructive conflict. The truth is, conflict can be scary for teams, including leaders. The fear is that the team will go over the edge and hit the point of destructive conflict where everything falls apart. This fear causes teams to try and avoid any conflict at all costs. They don’t have the confidence that their team can recover from destructive conflict, and come out on the other side, stronger and more cohesive. Therefore, many teams are happy to live in the facade of harmony, at the expense of engaging in real, productive conflict that leads to new and better solutions. But, when a team does know how to engage in constructive conflict and recover from those times when they may cross the center line, they are able to be more creative and more innovative – with the ability to solve tough problems. Conflict can be intimidating for both leaders and teams. But the truth is: conflict is natural and necessary. Hard as we may try, it cannot be avoided. The strongest, most connected and productive teams have the courage to push the envelope and engage in conflict that will ultimately make them better. A lot of my clients ask how they can start promoting constructive, productive conflict in their teams. The best place to start is by figuring out where your team is currently operating on the conflict continuum. This is a quick yet revealing exercise you can try in your team to gage overall perceptions of conflict. Draw a horizontal line on a white board or piece of flip chart paper. Now, ask each team member to tick on the scale where they believe the team lies. Are there more ticks leaning towards 0 or 10? Understanding team perceptions will pave the way to creating solutions and dialogues that lead to constructive conflict. Need help bringing your team to the Ideal Conflict Point? Let’s schedule a 15-minute conversation to discuss how your team currently engages in conflict, and how we can invite more healthy, and less destructive conflict into your team dynamic. Does your team engage in conflict of any kind? or not even at all? Here we talk about the difference between destructive and productive conflict and how they fit on the Conflict Continuum.